In the world of politics, full of polls and focus groups, “safe seats” and stacked districts, few people ever see fit to take a chance. That’s the opposite of business, where every day entrepreneurs put everything on the line in pursuit of success and happiness. A Scottsdale businessman is challenging Rep. John Kavanagh for the Republican nomination for their district’s open Senate seat. A lawsuit challenging Arizona Gov. Jan Brewer’s Medicaid expansion plan that was filed by fellow Republicans in the state Legislature was dismissed in a ruling released Saturday, handing Brewer a major victory in her battle against conservative members of her own party. 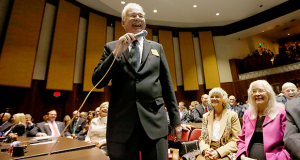 To curtail the inappropriate influence of money in politics, Arizona law prohibits lobbyists from contributing to lawmakers’ campaign committees while the Legislature is in session. If former Attorney General Terry Goddard jumps into the 2014 elections, it will likely be as a candidate for secretary of state. An Arizona government official says his department will review more than 6,000 unexamined reports of child abuse and neglect by Dec. 2. The midterm congressional elections are still a year off, but the Republican Party started ratcheting up its campaign this week against three freshman Arizona Democrats it has targeted in the race.